← One Month To Our IRT Desert Oasis Intensive!!! No training knives have ever been as well received as our Nok Knife trainers. They are simply better to work with than any other product out there on the market. Soft to touch, yet firm with resistance and the feel of a real knife. Simply great for real world, hard contact knife training! 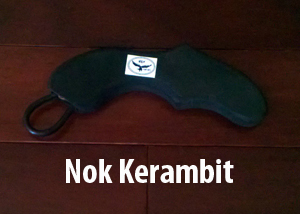 I have had several hundred requests for Nok Kerambit trainers and finally we have them in!